A two-story climbable structure would be an awesome element for the kids, utilizing the slope by building it next to or on top of one of the retaining walls. 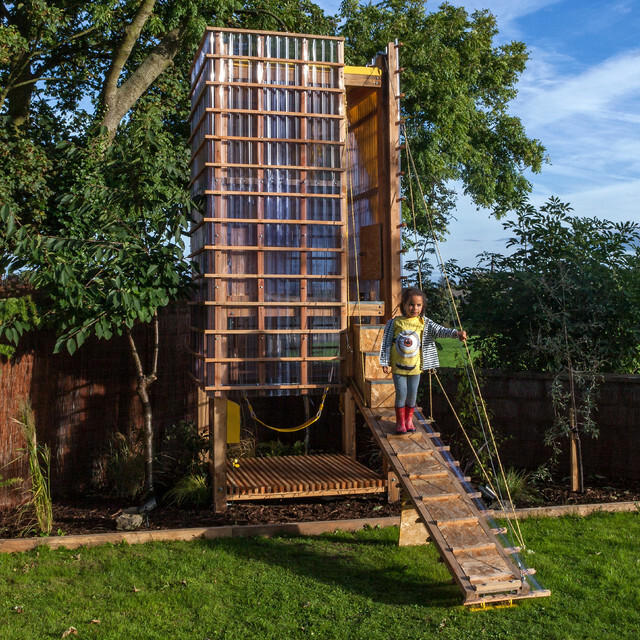 Built out of untreated Irish larch wood and clear acrylic corrugated sheeting, the award-winning play tower (measuring roughly 5 feet wide and 14 feet tall) has the lofted feel of a treehouse and a clear view of the growing landscape trees. “The drawbridge door was inspired by [a] local castle, which is in ruins and visible from the garden,” Kane says. The door can be raised and lowered by a manual winch located near the back of the structure.